According to reports from Chris Taylor at BJPenn.com, the UFC is going to change course for the upcoming UFC 224 pay-per-view card, which is set to occur Saturday, May 12 at Jeunesse Arena in Rio de Janeiro, Brazil. Originally the promotion was targeting the women’s bantamweight title fight between champion Amanda Nunes and challenger Raquel Pennington as the main event. 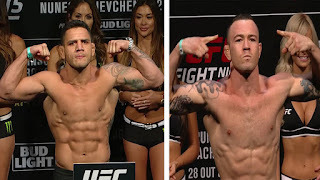 But the UFC has apparently changed its mind, and now an interim welterweight title bout between Rafael dos Anjos and Colby Covington will headline the card instead. What all fans and media can agree on is that this is a great fight. RDA is the former lightweight champ and since moving up to welterweight has gone a perfect 3-0, with a unanimous decision win over Robbie Lawler in his last bout. Covington is 8-1 in the UFC and won a unanimous decision over Demian Maia in his last fight. Both guys are looking amazing, and this is destined to be a great fight. But what fans and media have been split on is whether or not an interim title should be on the line here. I’m here to outline the arguments both ways -- why an interim title makes sense, and why it does not make sense. Let’s talk about why it doesn’t make sense first. If this is a sport, and the UFC is supposed to be MMA’s top entity, the championship belts should mean everything. UFC Welterweight Champion Tyron Woodley defended his title twice in 2017, once against Stephen “Wonderboy” Thompson and once against Maia, with his last outing coming in July 2017. Overall, it’s fair to say he’s been a dominant champion, and certainly the most dominant welterweight champ the UFC has had since Georges St-Pierre retired. Considering Woodley hasn’t even been laid off a year, the UFC introducing an interim title right now seems premature in the minds of many. At the same time, though, Woodley has not been active thus far in 2018, as he’s been out recovering from injuries, and he’s on record saying he prefers a money fight against GSP, Nate Diaz or Conor McGregor instead. The UFC matchmakers can't count on him right now. But the welterweight division is one of the UFC’s marquee weight classes and the promotion does not want to wait any longer to promote a title fight in it, especially considering the dominant win streaks of RDA and Covington. The UFC should be a sport first, but it’s actually a business first, and the UFC has made the business decision to set a new main event for UFC 224, as Nunes vs. Pennington just wasn’t interesting fans. From a business point of view, the pro wrestling-style storyline of the heel Covington coming down to Brazil to fight the babyface RDA makes all kinds of financial sense, and it’s easy to see why the UFC booked it. 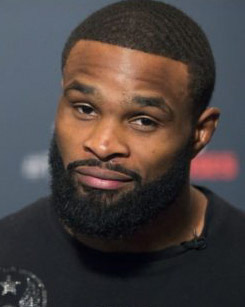 Having said that, introducing an interim title at this juncture seems like a slap in the face to Woodley, who fought four times within a 12-month span for the UFC. It wasn’t surprising to see him write “SMFH” on Twitter after news of RDA-Covington broke. Though he irks fans with his callouts of money fights and seeming unwillingness to fight the top contenders at 170 lbs, he still deserves the respect of being the champion, but the UFC didn’t even give him a full year off before bringing in an interim belt. In the past, fighters like Cain Velasquez and Dominick Cruz had much longer layoffs before an interim title came into play, so it’s easy to see why Woodley isn’t happy with this news. Then again, it’s not like this is the first time the UFC has introduced interim belts, and Woodley shouldn’t be surprised the UFC did this. We’ve already seen the promotion book interim belts in the lightweight and featherweight divisions due to Conor McGregor’s layoff, so perhaps times are changing at the UFC, who used to wait much longer before bringing in second belts. It seems like the promotion has internal metrics suggesting title fights sell more on pay-per-view than non-title fights, so it makes business sense. 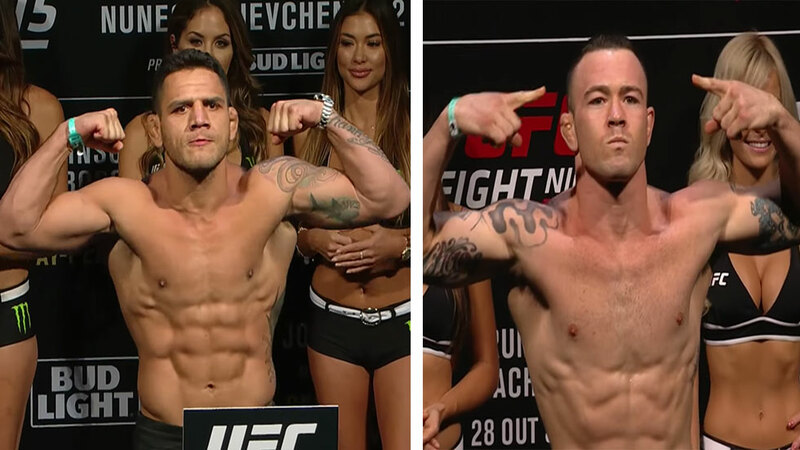 And let’s be honest, RDA vs. Covington deserves to be a five-round fight, which can happen now because it’s a PPV main event. A title fight likely also means the fighters get paid more money, which is a good thing. And it’s straight-up just a much better fight than Nunes vs. Pennington. I’m still torn on whether or not I like this RDA vs. Covington fight being for an interim belt, but generally I side with being ok with it. While I understand the argument behind interim belts cheapening the real titles, this fight is much better served as a five-rounder, and it deserves to headline a PPV. The only way that was going to happen was it being for an interim belt. I can understand why Woodley would be frustrated, but all signs point to the UFC making the right business decision here by booking a great fight with a belt on the line. Now let’s just hope for no injuries to anyone involved.